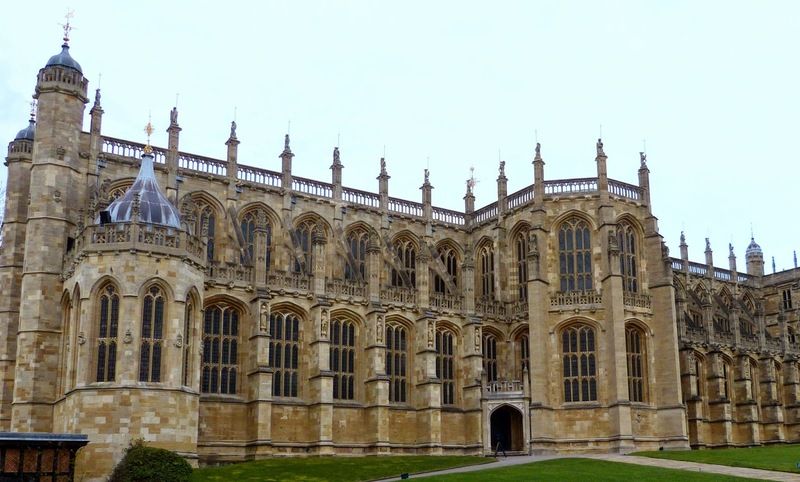 St George’s Chapel stands in the Lower Ward of Windsor Castle. 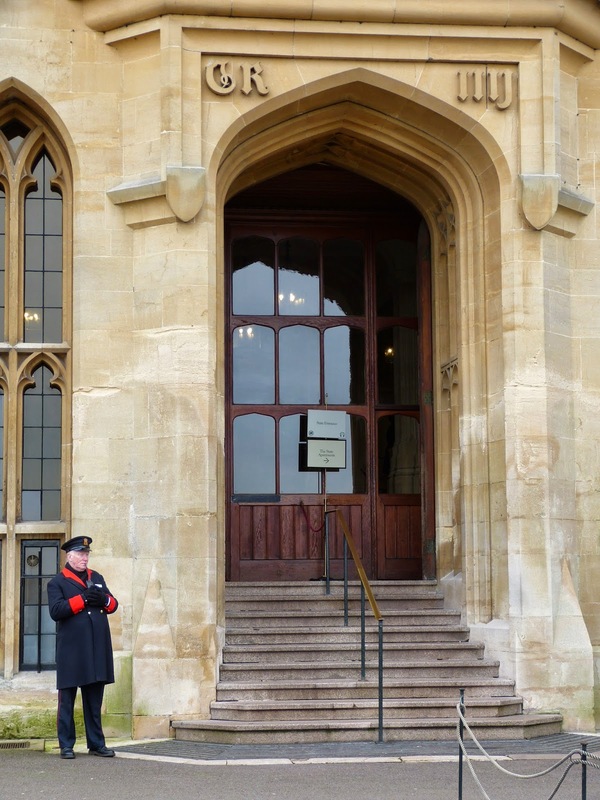 It is the home of the College of St George and the spiritual home of the Order of the Garter. It is built in the graceful architectural style of English Perpendicular Gothic with characteristically large windows with vertical tracery and fan vaulting. The College of St George was founded by Edward III in 1348. At the same time, he created the Order of the Garter, a chivalric order inspired by King Arthur’s legendary Knights of the Round Table, and he provided each of the 25 knights with a stall in the chapel of St George’s. Edward III also appointed 26 poor military veterans whom he called Poor Knights as part of the College. Their duty was to pray for the King and the Knights of the Order in return for food and lodging. Their number was later halved and in 1834, they were renamed Military Knights. 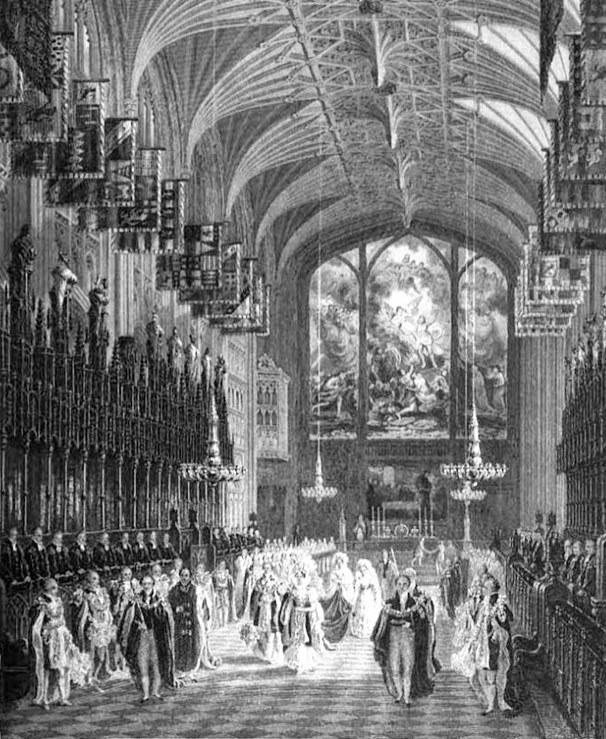 There is an annual service for the Order of the Garter held in St George’s Chapel. The banners of living Knights of the Garter hang in the choir. In 1475, Edward IV commissioned a new chapel for the College of St George. Work began under the supervision of Richard Beauchamp, Bishop of Salisbury and Chancellor of the Order, and the choir (1) was finished, with a wooden roof, in 1484. During the reign of Henry VII, the nave was finished, the huge stained glass West Window completed and the choir vault built. The chapel was finally completed in 1528, during the reign of Henry VIII, with the building of the fan vaulting over the crossing. 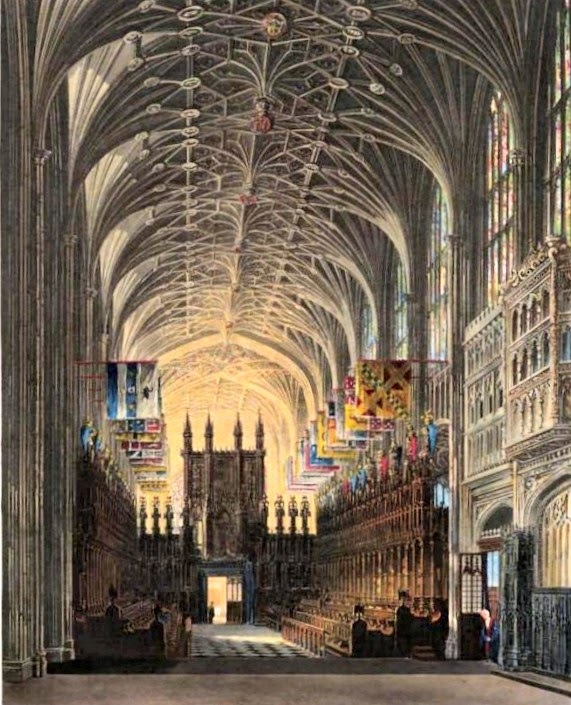 St George’s Chapel was restored during the reign of George III by Henry Emlyn. The chapel was fitted out with an organ, built by Samuel Green of Isleworth and paid for by the King, and an organ screen of Coade stone was designed to carry it. 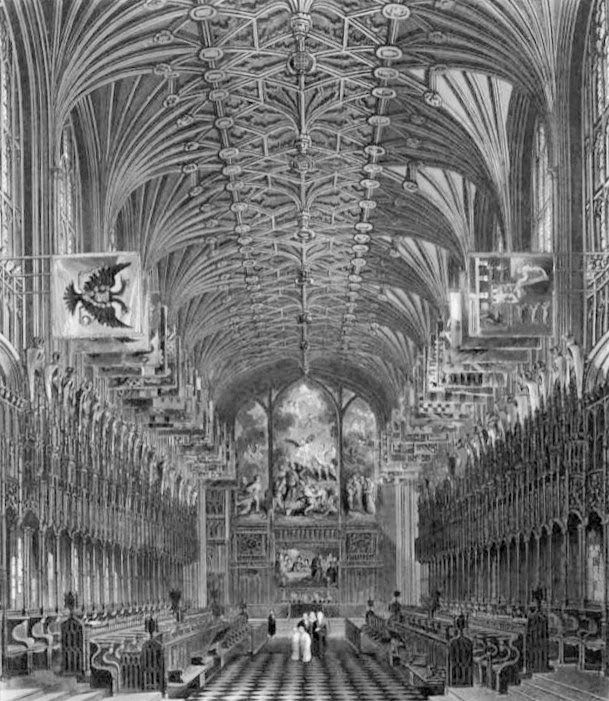 The choir was furnished with carved oak stalls with elaborate canopies and brass stall plates embellished with the arms of the Knights of the Garter fixed to the back of each stall. Charlotte, Princess of Wales, the only daughter of George IV, died on 6 November 1817 after giving birth to a stillborn son the evening before. 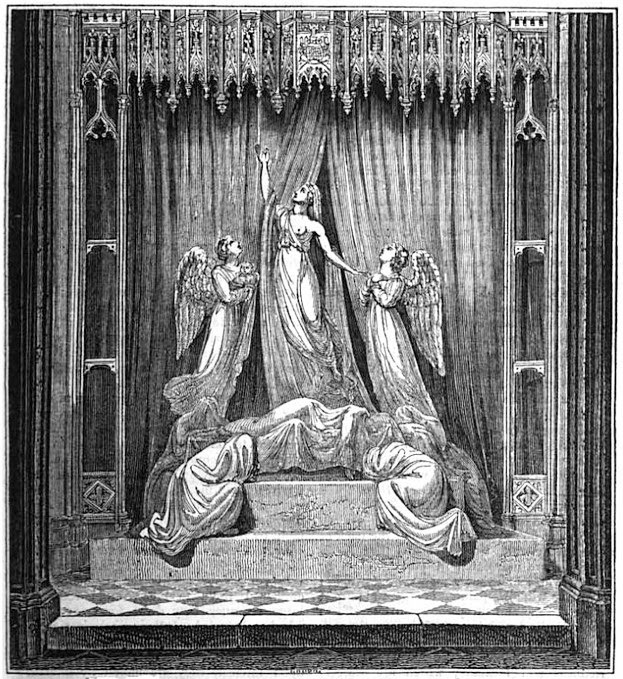 The mourning public raised a subscription for a memorial to their beloved princess but rather than placing it in a public location, George IV built it in the Urswick Chapel, within the confines of St George’s Chapel. Whom she survived only three months. A new royal vault was built by George III in 1804-10. It is entered by a subterranean passage from the vault under the choir of St George’s Chapel. William, Duke of Gloucester, George III’s brother, built a special vault near the Sovereign’s stall in the choir for his family burials. All burials were in the royal vault unless otherwise indicated. 10 January 1930 - Prince Adolphus, Duke of Cambridge, and Princess Augusta, Dowager Duchess of Cambridge, transferred from Kew to the royal vault. Adjacent to St George’s Chapel is the Albert Memorial Chapel, built by Queen Victoria to commemorate the death of her husband, Prince Albert, who died in 1861. (1) The College of St George, Windsor, website uses the Anglican alternative spelling quire. 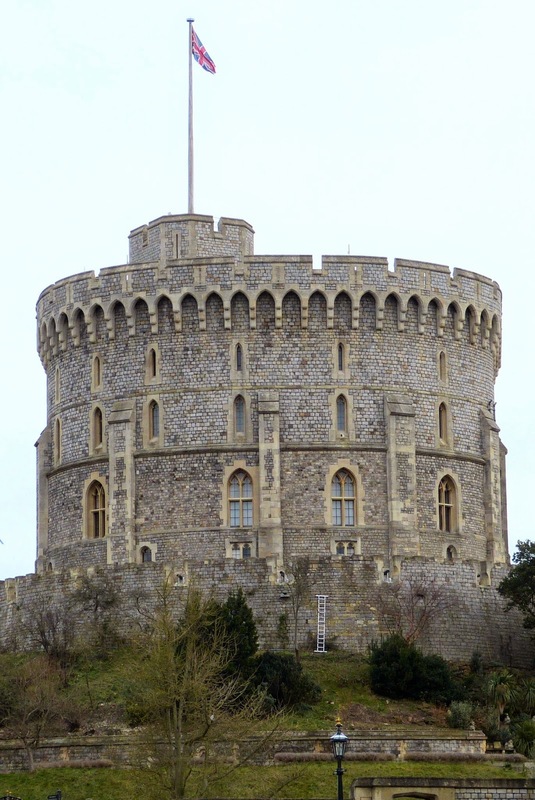 Read more about Windsor Castle in my Regency History guide here. 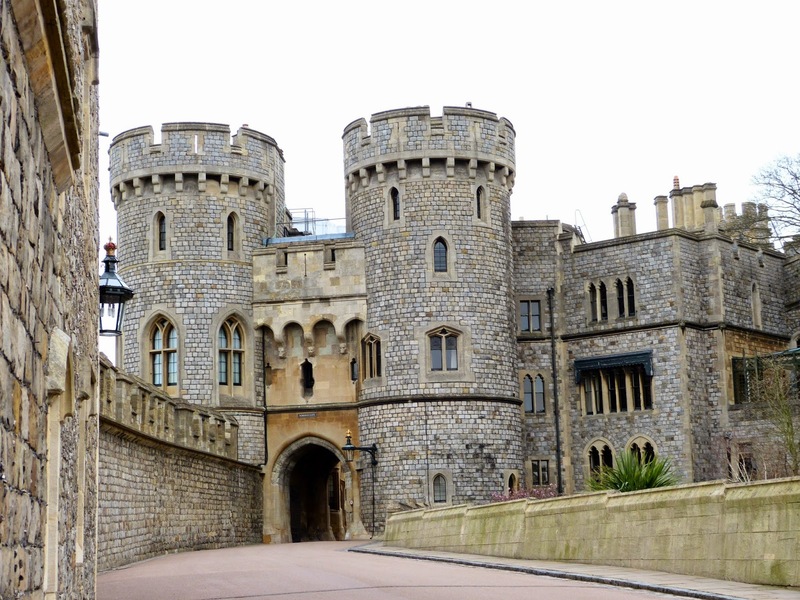 Windsor Castle is in Windsor in Berkshire. It is one of the Queen’s official residences. 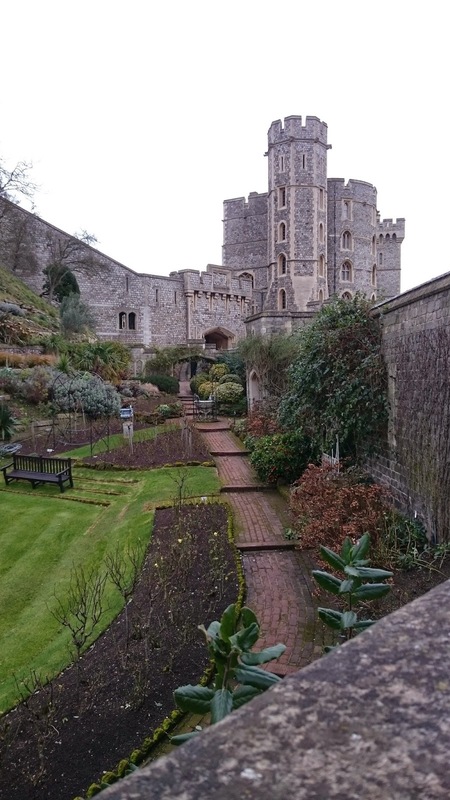 Windsor Castle dates from the time of William the Conqueror who built a defensive motte and bailey castle on the site around 1080. Henry I started to use it as a royal residence from around 1100, attracted by the royal hunting forest in what is now Windsor Great Park and the castle’s close proximity to London. Over the years, successive monarchs modified and expanded the castle. Henry II largely rebuilt the castle in stone in the 1170s. Edward III added the Norman Gate and transformed the castle into a Gothic palace. He established the Order of the Garter in 1348 and built St George’s Hall. In 1475, Edward IV started the building of St George’s Chapel and Henry VIII added the gate that carries his name in 1511. During the Civil War (1642-9), the castle was used as a prison by the Parliamentarians and stripped of many of its treasures. 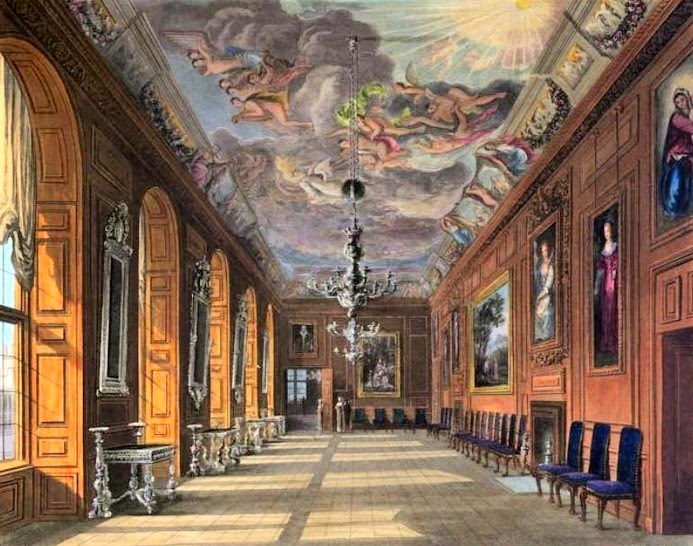 After the Restoration, Charles II revived the castle’s splendour in the Baroque style using the skills of a master woodcarver, Grinling Gibbons, to embellish his oak-panelled rooms and the Italian artist Antonio Verrio to paint the ceilings. He also established The Long Walk in the Great Park. The early Hanoverian monarchs had a preference for Hampton Court, but George III disliked it and chose to reside at Windsor Castle instead. 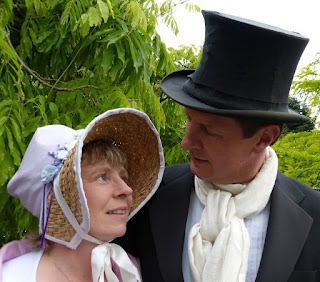 He took over a house in the Great Park and remodelled it with the help of Sir William Chambers. This became known as the Upper or Queen’s Lodge and the King lived very informally here. In 1790, George III took over the management of Windsor Great Park, laying out two large farms and purchasing the lease of Frogmore House for Queen Charlotte. 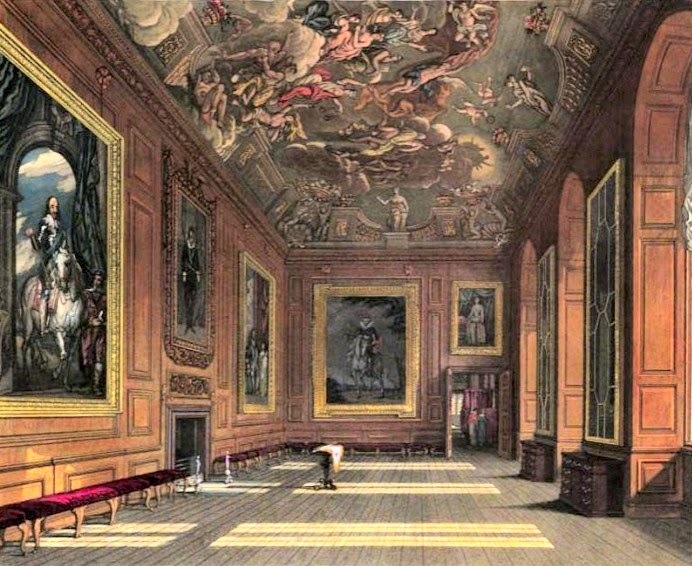 With the help of James Wyatt, George III started to upgrade the main castle buildings. The existing round arched windows were changed into pointed Gothic ones. Oak panelling was removed and replaced with fabric to lighten the rooms and a new Gothic staircase was built. During the Regency, George IV built and lived at the Royal Lodge in Windsor Great Park, but when he became king, he wanted to move into the castle. However, he found the existing accommodations inadequate and planned an extensive redevelopment of the castle with the help of his artistic advisor, Sir Charles Long. 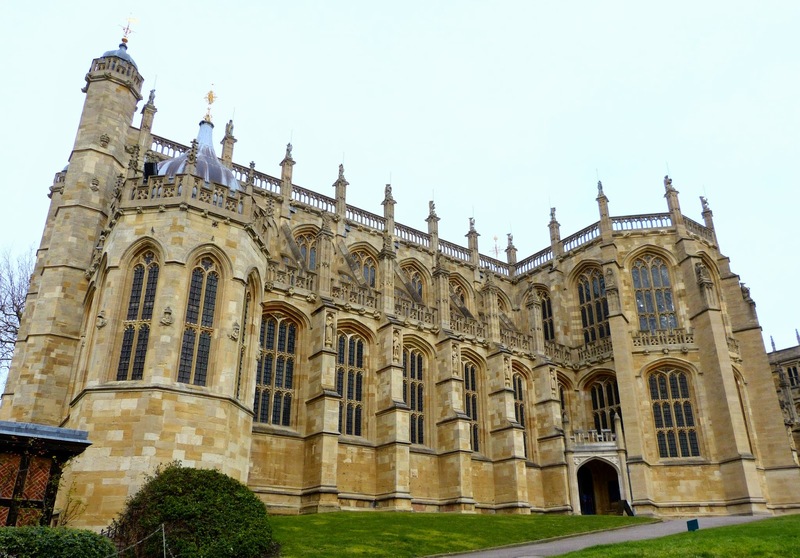 He transformed Windsor Castle at the cost of almost one million pounds, employing Jeffry Wyatt, nephew of his father’s architect, to carry out the work. Jeffry Wyatt was knighted for his endeavours and changed his name to Wyatville. Wyatville built new towers and a range of new State Apartments for the King on the east and south sides of the castle, adding the Grand Corridor along two sides of the Quadrangle to make moving about the castle easier. He increased the height of the Round Tower and created a new entrance, the George IV gateway, and gave it a clear view to the Long Walk in the Great Park. 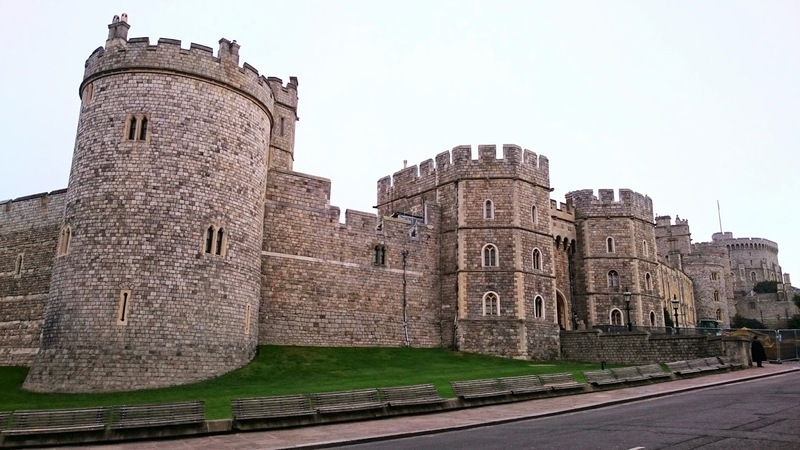 He made the outside of the castle uniformly Gothic in appearance and added battlements creating Windsor’s iconic skyline. In 1829, Wyatville fashioned a new St George’s Hall from the existing one and the adjacent chapel, destroying Verrio’s murals in the process. 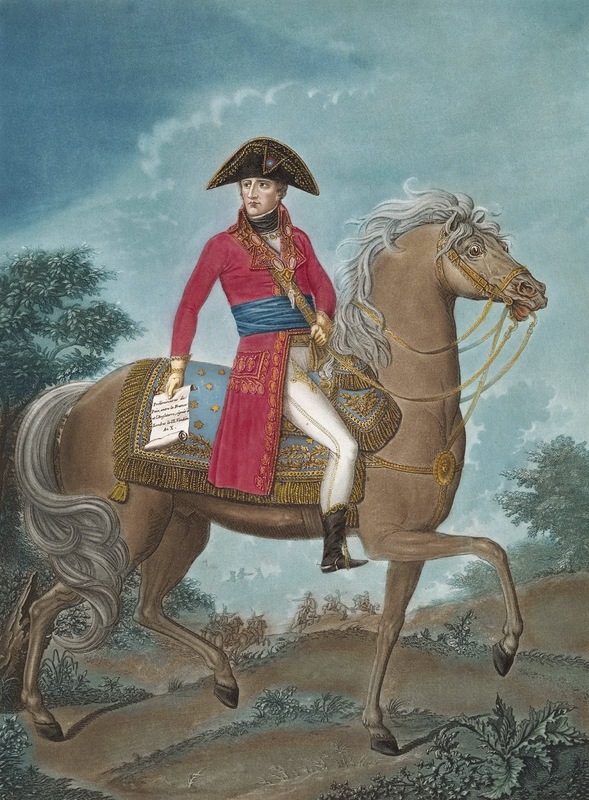 George IV liked to mix up his styles. 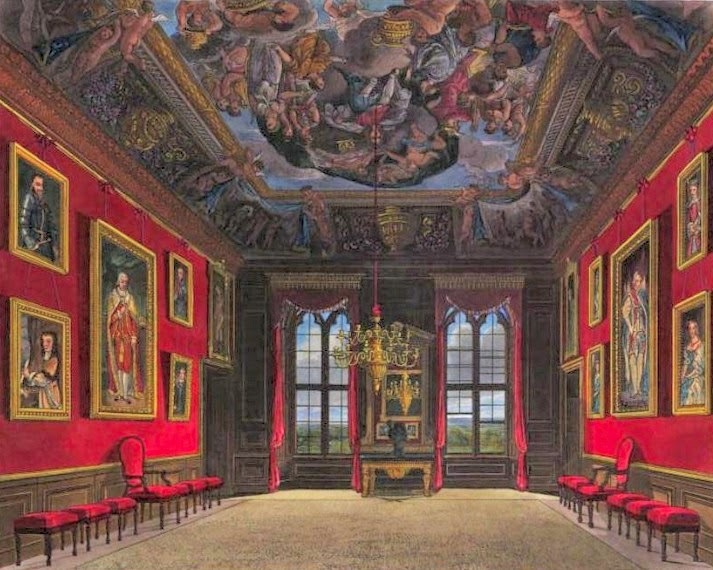 Some of his rooms were very Gothic, such as the State Dining Room, whereas others were more classical, influenced by his Francophile taste, such as the Crimson Drawing Room. A surprising number of items were brought from Carlton House and reused in the castle including a number of chimney pieces and doors. The new State Apartments were fitted out by the firm of Morel & Sedon who employed the young AWN Pugin, among others, to design the Gothic furniture and fittings. George IV moved into the castle in 1828, just two years before his death, and with the work unfinished. 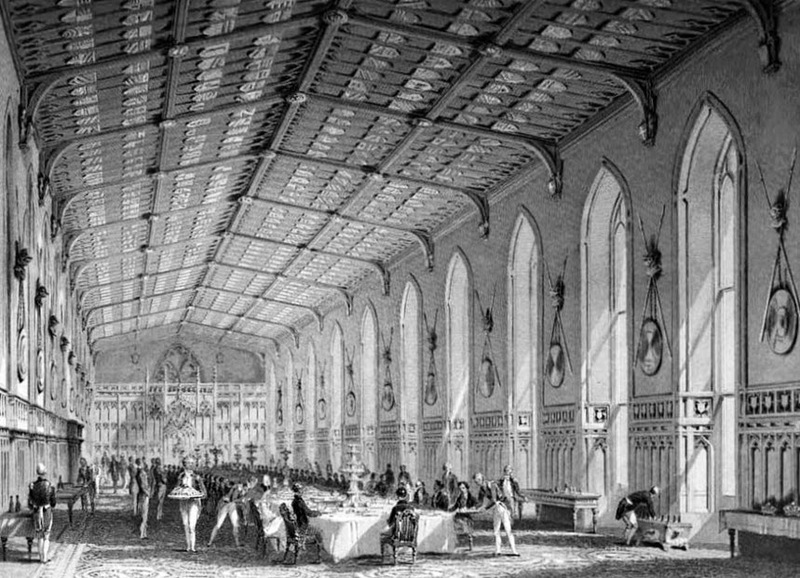 William IV completed the building works, including the Waterloo Chamber, which was part of George IV’s original plan for the redevelopment of Windsor. 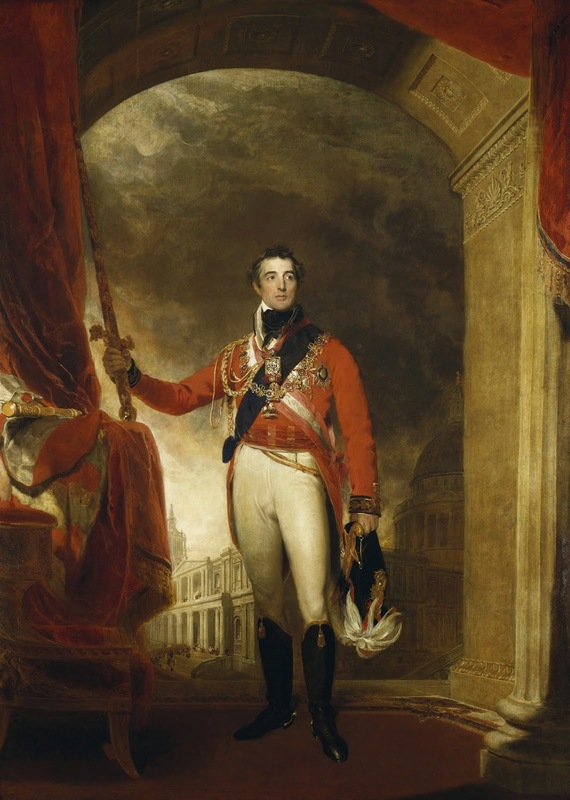 It was a room specifically designed to house Sir Thomas Lawrence’s portraits of the Allied monarchs, commanders and statesmen commissioned by George IV. Unfortunately, William lacked George’s artistic eye and the work was not always completed as precisely as George had intended. Much of Windsor today is as it was at the end of William IV’s reign. A few alterations have been made, such as Queen Victoria rebuilding the Grand Staircase, but the most significant changes have been the result of a devastating fire in 1992. This damaged a major part of the castle including George IV’s State Apartments and destroyed the ceiling of St George’s Hall. Thankfully, the rooms were largely empty at the time as the castle was in the process of being rewired. 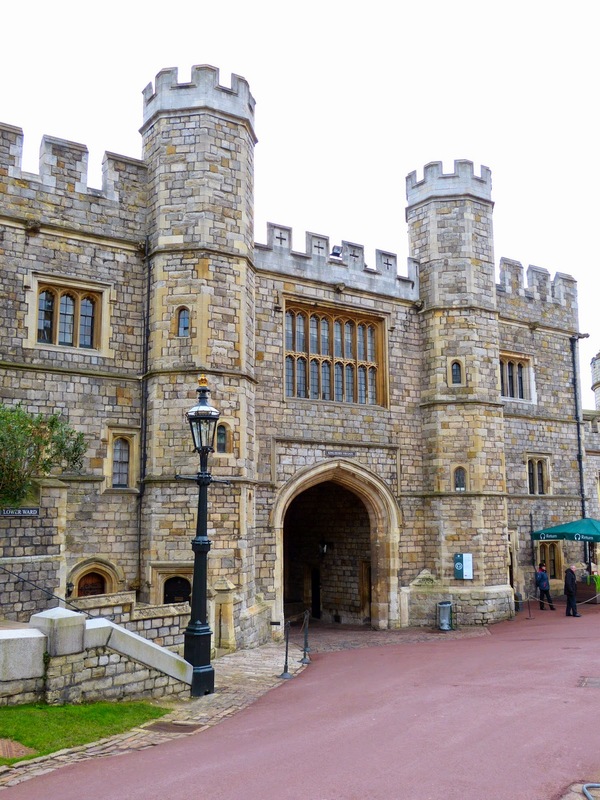 Windsor Castle has now been restored to its former glory. As this is an active royal residence, the castle may be closed on certain days. Check on the website here. The State Apartments are open most of the year but the Semi-State Rooms (The Green Drawing Room, the Crimson Drawing Room, the State Dining Room, the Octagon Dining Room and the corridors that connect them to the State Apartments) are only open September to March. St George’s Chapel is closed on Sundays except for services. No photography is allowed inside the buildings and so I have used old prints of the rooms to illustrate but please note that the Pyne prints illustrate the rooms in George III's time before his son's alterations. • Queen Mary’s dolls’ house. Given to Queen Mary in 1924, it is made on a scale of one to twelve and housed in a separate room to the left of the entrance to the State Apartments. • The Drawings Gallery. This is situated at the top of the stairs leading into the State Apartments. 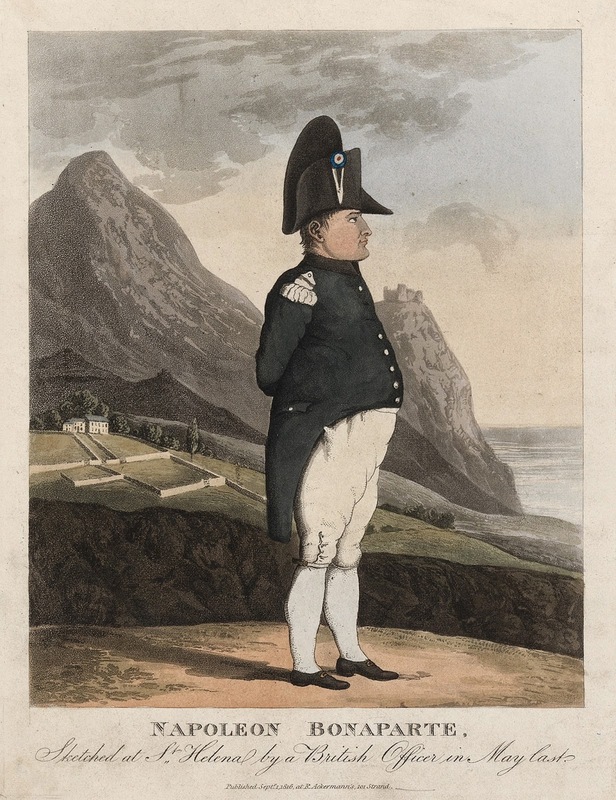 This has a selection of prints and drawings from the Royal Collection on display, currently on the theme of Waterloo. • The magnificent larger than life-size marble statue of George IV on the Grand Staircase by Sir Francis Chantrey. • The China Museum. Displays include the Etruscan service made in Naples 1785-7 and given to George III by the King of Naples in 1787. • Queen Charlotte’s sedan chairs in the Grand Vestibule. There are two chairs which were both made for Queen Charlotte. Each has a crown on the roof, but one is highly decorated and the other is quite plain except for the base which is decorated by a lion on one side and a unicorn on the other. On the wall next to the ornate chair are the poles that were used to carry it. Both chairs are quite small – I imagine they must have been quite claustrophobic! • The Waterloo Chamber. 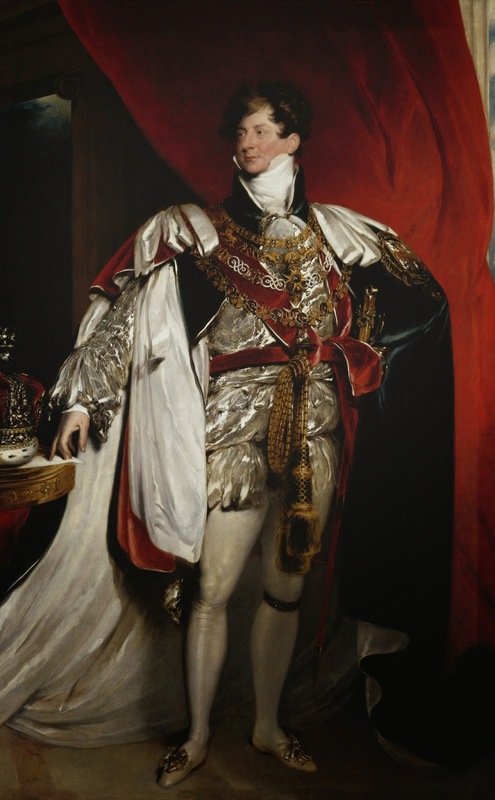 The majority of the portraits were painted by Sir Thomas Lawrence, commissioned by George IV. 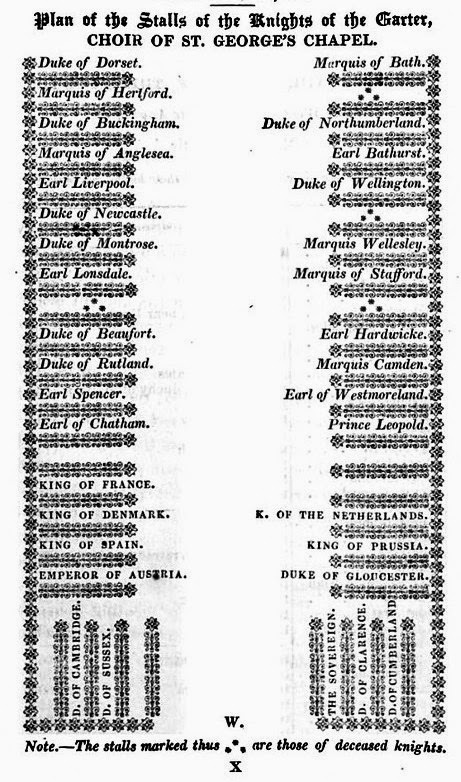 They include the Duke of Wellington; Pope Pius VII; George III; George IV; Frederick, Duke of York; and Adolphus, Duke of Cambridge. • King’s Drawing Room. Part of Charles II’s Baroque palace. George IV’s body lay in state in this room after his death in 1830. • King’s Bedchamber. Another of the Charles II rooms, displaying a bed purchased by George IV. The fireplace was designed by Sir William Chambers and was originally at Buckingham House. • King’s Dining Room. 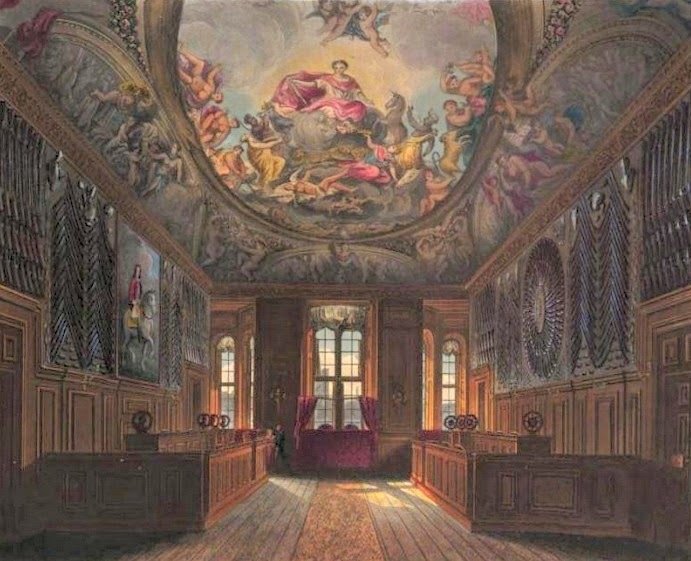 This room still has its ceiling by Verrio and wood carvings by Grinling Gibbons. It is rather dark as all the windows are internal. • Queen’s Ballroom. Full of Van Dyck paintings. • Queen’s Presence Chamber. The ceiling is by Verrio and depicts Catherine of Braganza and the Sword of Justice defeating Envy and Sedition. The marble chimneypiece includes a clock with marble figures on either side which was carved by John Bacon in 1789 for Queen Charlotte’s Saloon at Buckingham House. The Gobelins tapestries were acquired by George IV. • Queen’s Guard Chamber. This room was remodelled in the Gothic style for George IV. On display are the rent flags of the Dukes of Wellington and Marlborough, hanging over marble busts of the two men. These rent flags must be presented annually to the crown in lieu of rent for their estates. The Duke of Wellington has to present a Republican tricolour for his estate of Stratfield Saye on 18 June, the anniversary of the Battle of Waterloo; the Duke of Marlborough presents a Bourbon fleurs-de-lys for Blenheim Palace on 2 August, the anniversary of the Battle of Blenheim. 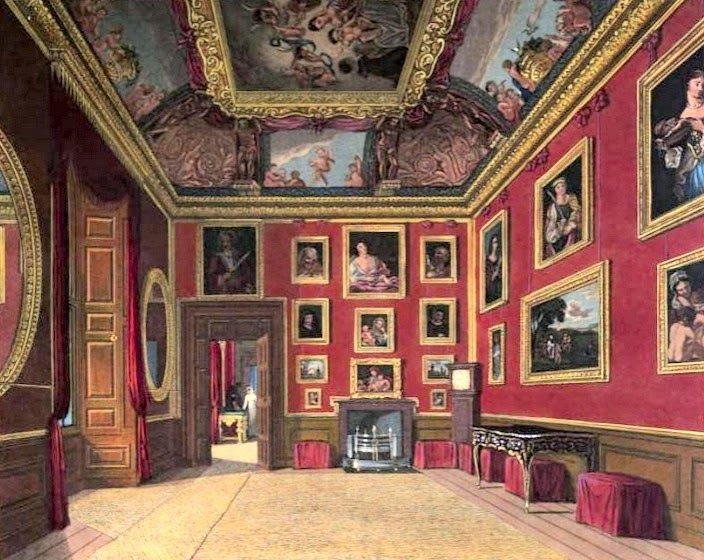 • Crimson Drawing Room. This room has bay windows and looks out over the gardens and has been beautifully restored in crimson and gold after the 1992 fire to the splendour of George IV’s original design. There are portraits of all six of George III’s daughters by Sir William Beechey on display. • State Dining Room. 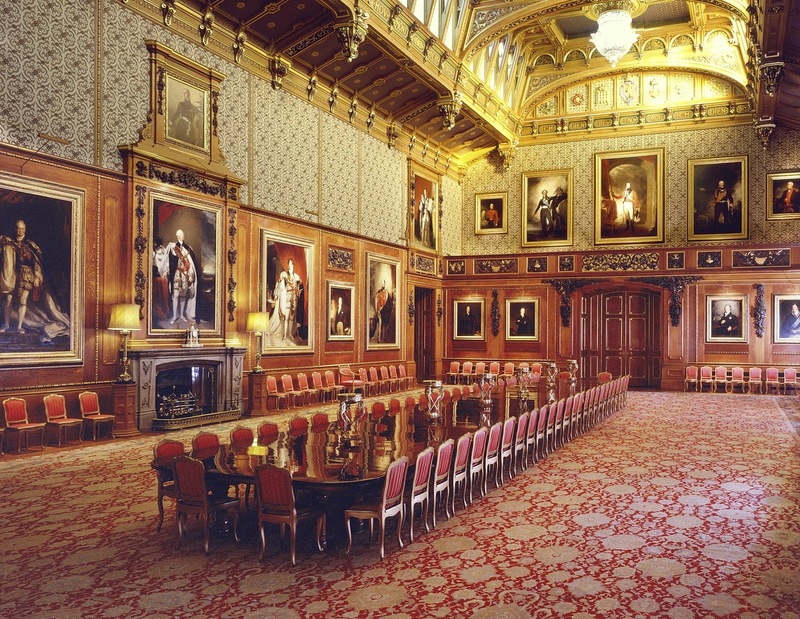 George IV’s Gothic dining room was restored after the fire to the design of Morel & Seddons. On display is a painting by George Knapton of The Family of Frederick Prince of Wales (1751) and furniture designed by AC Pugin and his 15 year old son, AWN Pugin who became a very famous architect and designer. • Garter Throne Room. 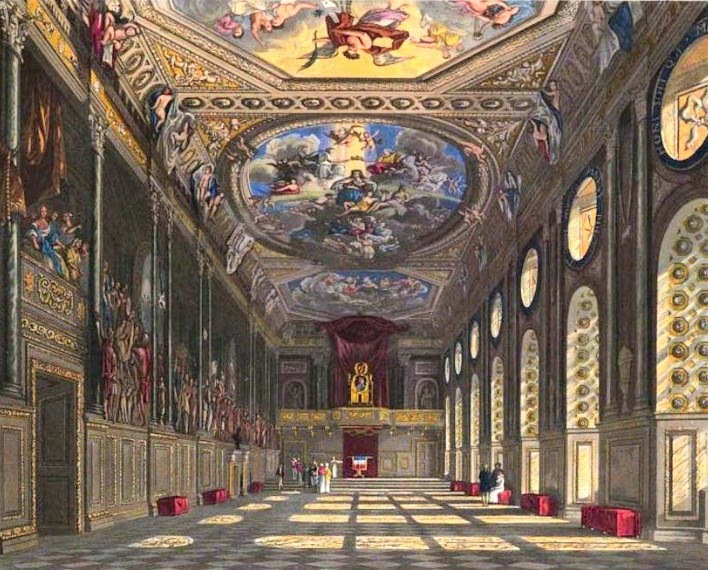 The elaborate canopy above the throne was originally made for George III’s Audience Chamber. • St George’s Hall. The Romantic Gothic design is said to have been inspired by Sir Walter Scott. 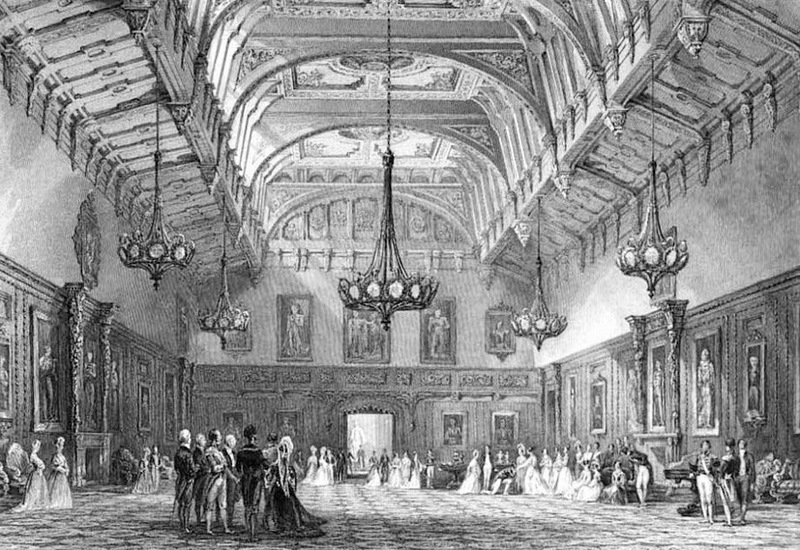 It was built by Wyatville for George IV but has a completely new ceiling to replace the one damaged by the fire. There are shields all over the walls and ceiling representing the knights of the Order of the Garter. There are a number of Georgian busts on display including Frederick, Duke of York, by Joseph Nollekens (1813) and George IV by Sir Francis Chantrey (1826). • Lantern Lobby. A new room to replace the chapel destroyed by the fire. On display are many silver-gilt vessels acquired by George IV and Henry VIII’s armour. • St George’s Chapel. Perpendicular Gothic architecture with a monument to Princess Charlotte inside. 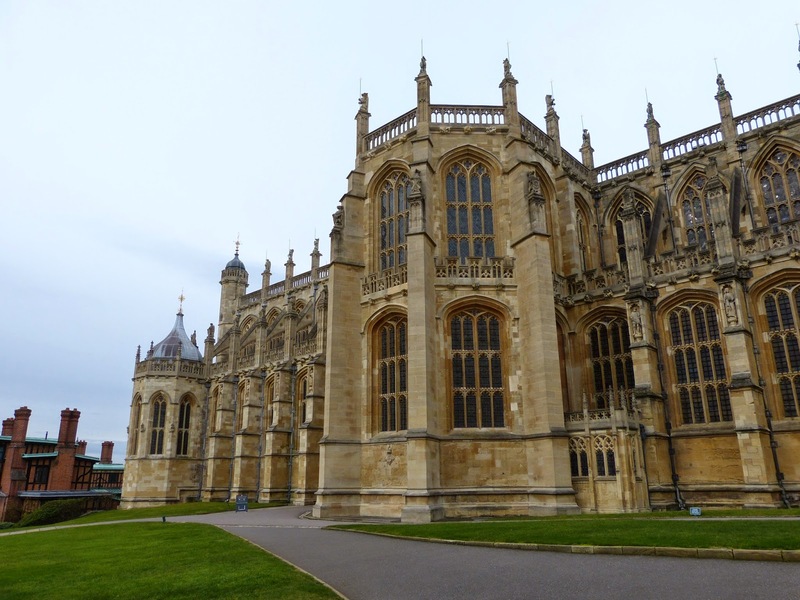 Read more about St George's Chapel in my Regency History guide here. 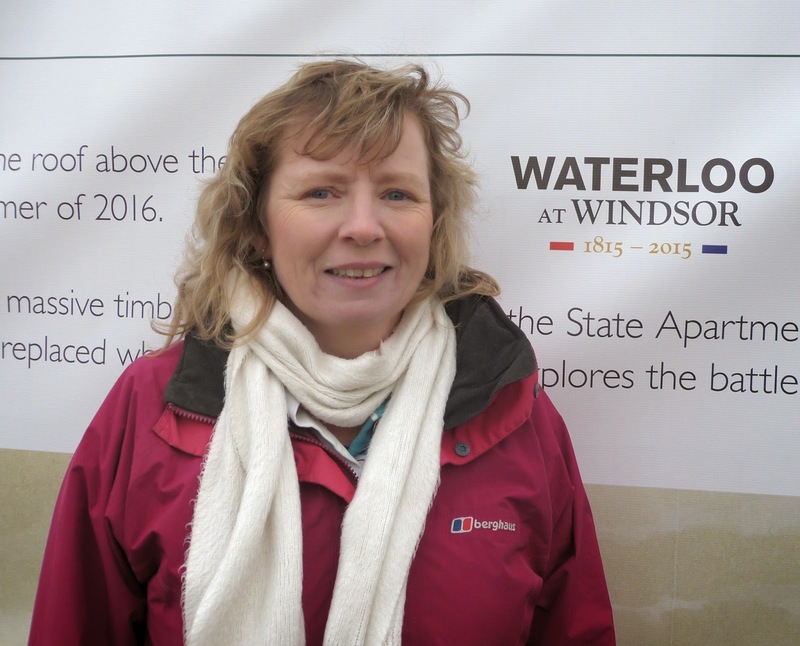 The Waterloo at Windsor 1815-2015 exhibition celebrates the 200th anniversary of the Battle of Waterloo which took place on 18 June 1815. This battle marked the defeat of Napoleon and ushered in an era of peace between Britain and France. The main part of the exhibition is in the Drawings Gallery with other items spread throughout the State Apartments. 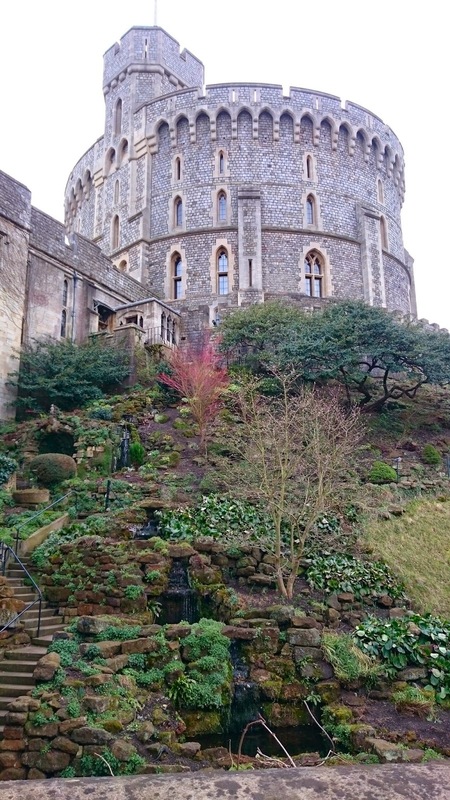 There is a souvenir map and guide to the exhibition which is included free with the Windsor Castle guidebook or it can be bought separately for £2. The exhibition runs until 6 January 2016. 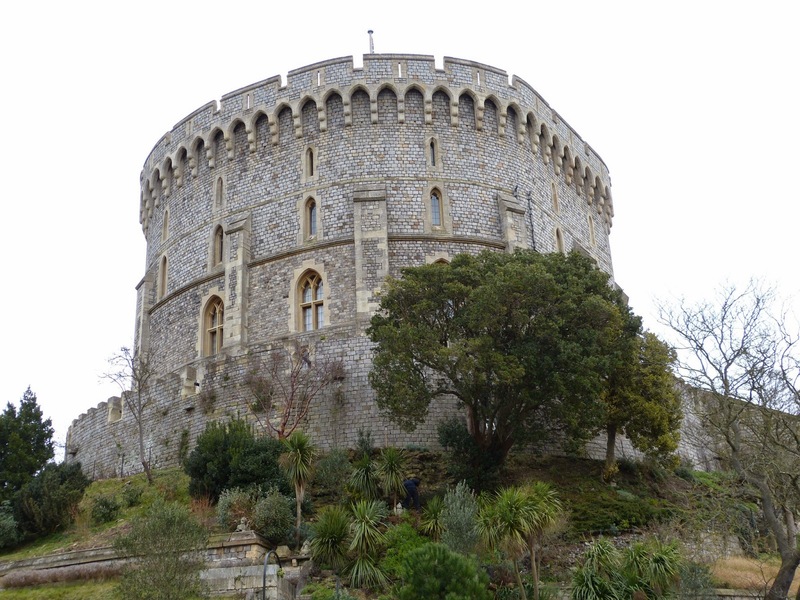 Read about the history of Windsor Castle in my Regency History guide. The Drawings Gallery is at the top of the stairs leading to the State Apartments. Don’t miss it! First time round, we walked straight past it into the State Apartments on the right and had to go back to find out where it was. 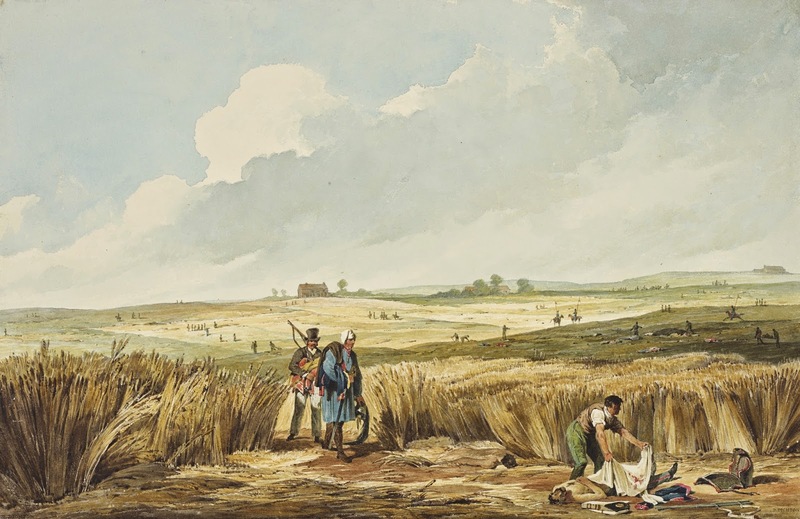 The Drawings Gallery contains a display of pictures and prints about Waterloo from the Royal Collection, most of which were collected by George IV who was fanatical about the Battle of Waterloo. These include contemporary satirical prints and drawings of the battlefield as well as pictures of the military leaders from both sides. 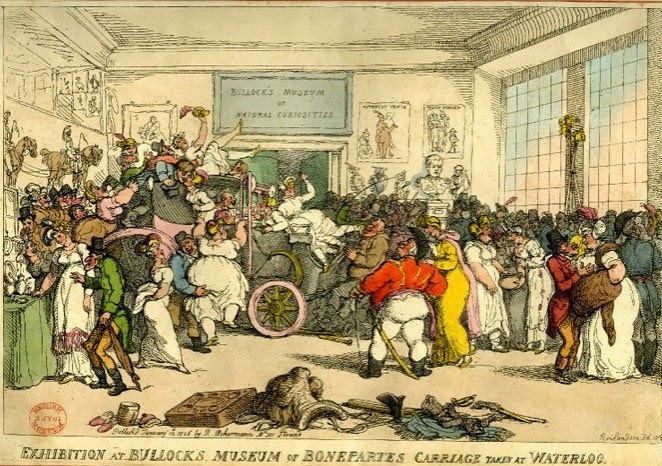 I was especially interested in a Rowlandson print of Bullock’s Museum from 1816. After the Battle of Waterloo, Napoleon’s carriage was captured by the allied army. The British government sold the carriage to William Bullock who put it on display in his museum in London in 1816. The print depicts a huge crowd of people climbing all over Napoleon’s carriage which proved to be a very popular exhibit. What I cannot figure out is why he was allowed to buy the carriage in the first place. Given George IV’s obsession with Waterloo, I thought he would have bought it for his collection. I guess that he could not afford it! 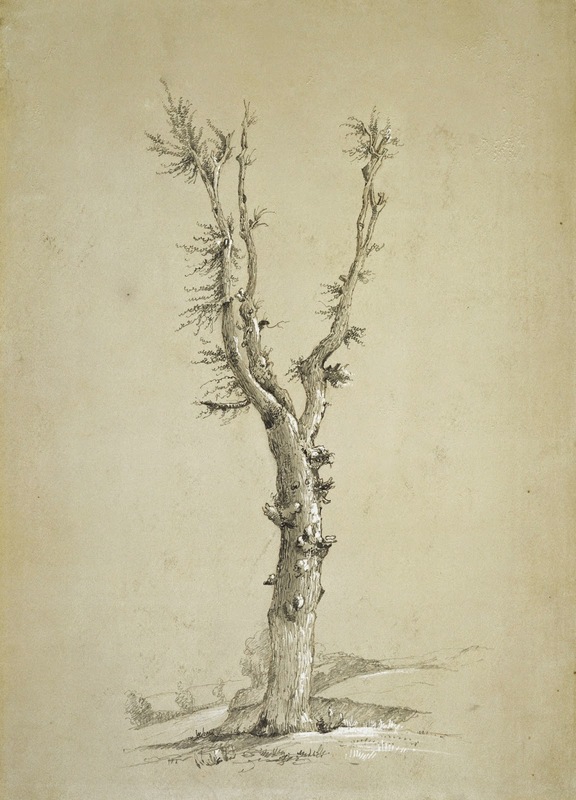 The other picture I particularly liked was a drawing by Anna Children – The Waterloo Elm (1818). This depicts the tree under which the Duke of Wellington sat on the battlefield of Waterloo. After the battle, it became a popular haunt of tourists who took bits of tree home with them as souvenirs. The owner of the land grew tired of having his crops ruined and decided to cut the tree down. Fortunately, Anna was able to draw the tree before it was felled and her father bought the wood from the owner. 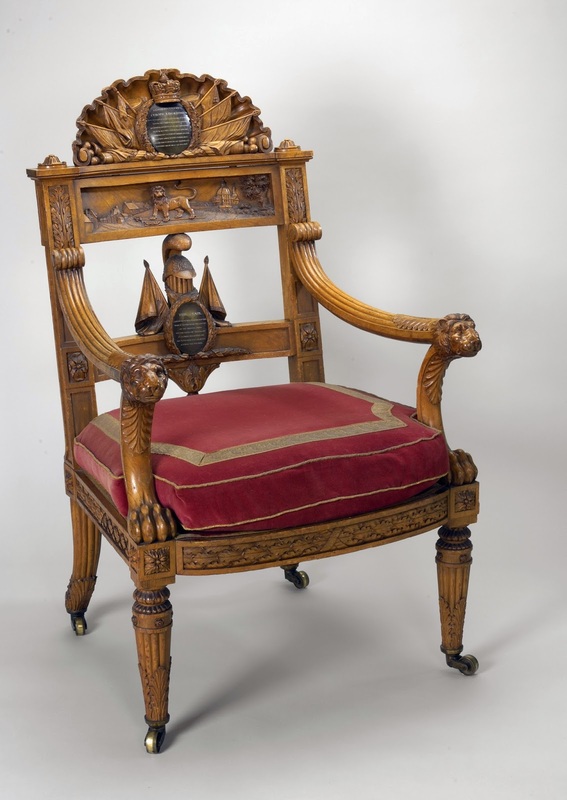 One of the pieces of furniture made from wood from the elm tree was The Waterloo Chair. It was carved by Thomas Chippendale the Younger and presented to George IV in 1821. It is on display in King’s Drawing Room. Next to The Waterloo Chair, is the Table of the Great Commanders. 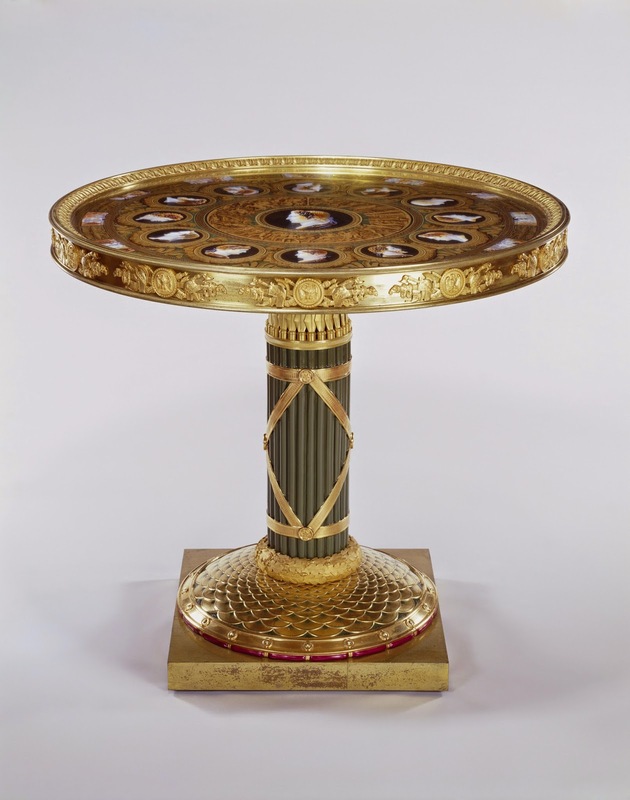 This exquisite table was made for Napoleon and given to George IV while he was Regent by the restored King of France, Louis XVIII. George liked it so much that he had it painted in the background of all his state portraits. I saw it last year at Buckingham Palace where it is usually on show. 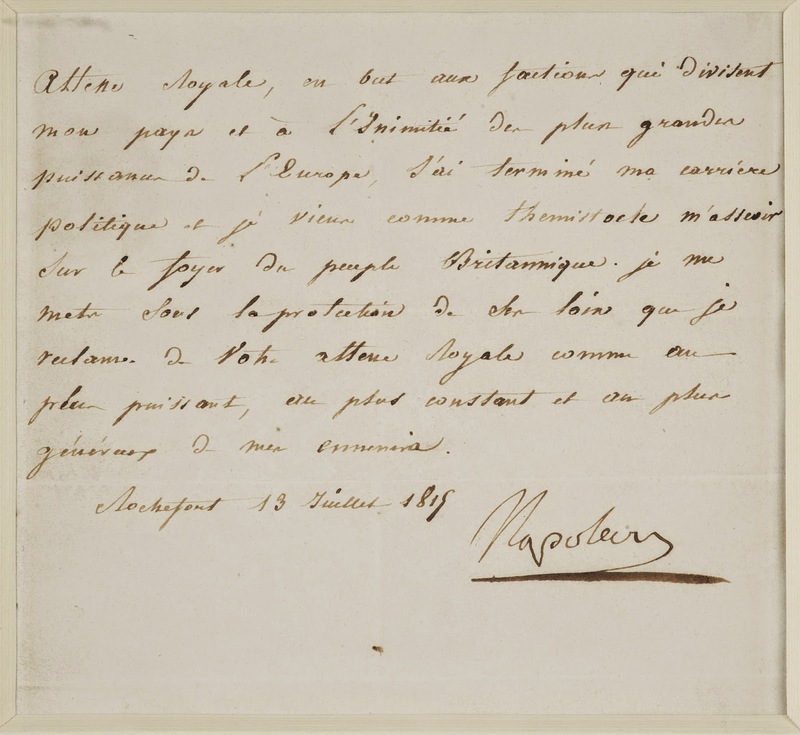 There are a number of Napoleon Bonaparte’s belongings on display which were retrieved from his carriage and baggage train after they were captured. 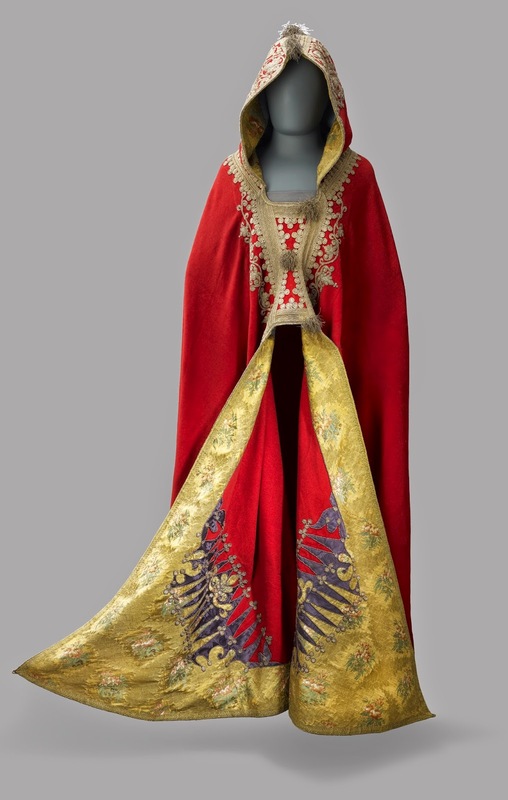 One of the most impressive of these is Napoleon’s cloak – a stunning, full-length, hooded red felt cloak lined with yellow silk – which is on display in the Grand Vestibule. If you stand next to the display, you can get a feel for how tall Napoleon really was. The audio guide says he was about 5 foot 6 inches which was average for the time. Across the room from Napoleon’s cloak is his old adversary, the Duke of Wellington, represented by a marble bust. 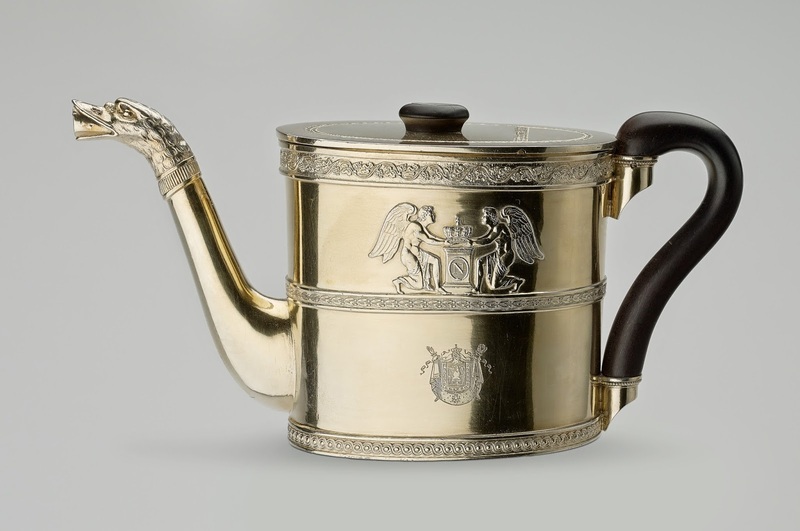 More items from Napoleon’s baggage train are on display in the Queen’s Guard Chamber, including his travelling desk set, an engraved silver-gilt tea service and a sword. 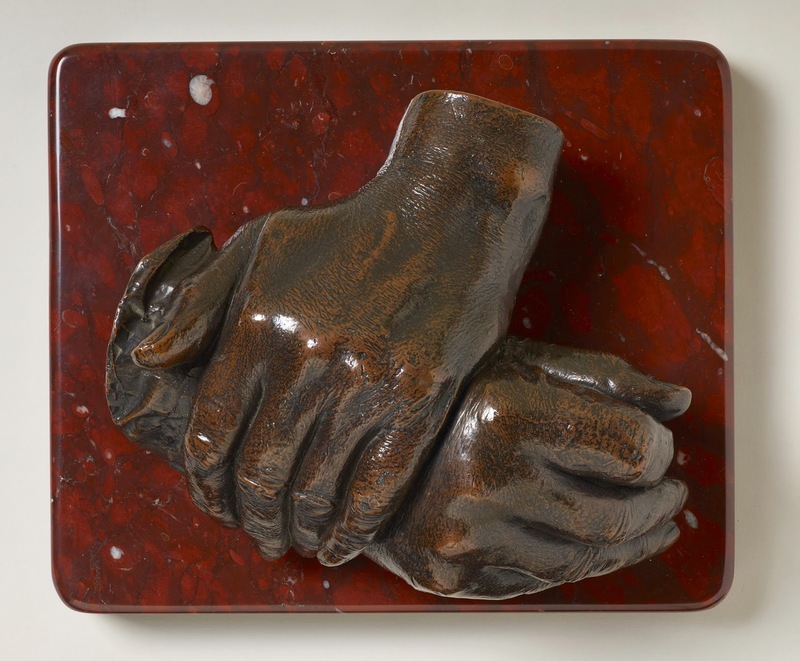 In the Queen’s Guard Chamber there is a copper cast of the Duke of Wellington’s hands. There is also a second marble bust of the Duke and above this hangs what is known as a rent flag. The Duke of Wellington was awarded the estate of Stratfield Saye in 1817 in thanks for his military endeavours at Waterloo. His rent to the crown each year is the presentation of a ‘rent flag’ to the crown – a tricolour flag edged in gold braid ending in two golden tassels and with the year to which it relates embroidered or printed on. Flags from previous years can be seen hanging from the ceiling in the Drawings Gallery. The Waterloo Chamber holds an impressive display of portraits of the allied sovereigns, military leaders and statesmen of the time. They were largely commissioned by George IV and painted by Sir Thomas Lawrence, but the room itself was not created until the 1830s, in the reign of William IV. Although these paintings are always on display at Windsor, the Chamber has been specially opened up for the exhibition this year and it is possible to walk all around the room and get a much closer look than normal. The Waterloo at Windsor exhibition is free with a standard entry ticket to Windsor Castle. For me, the highlights of the exhibition were Napoleon’s cloak and The Waterloo Chair, and being able to take a closer look at all the portraits in the Waterloo Chamber. I would have liked to have seen a few more items of Waterloo memorabilia on display; the drawings were interesting but it is the objects that really bring the subject to life. If you have visited Windsor recently, I would hesitate to recommend going just to see the exhibition unless you are a big fan of Napoleon or Waterloo. 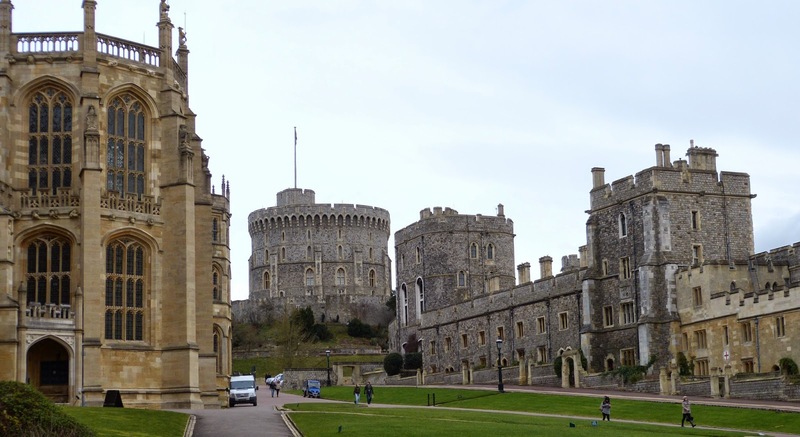 However, Windsor Castle is well worth seeing and this is a really good time to visit as the Waterloo Chamber is so much more accessible than usual. An added bonus if you visit before 29 March is that the Semi-State Rooms are open, giving you a peek at several rooms not open during the summer, including the Crimson Drawing Room with its superb portraits of all six of George III’s daughters. 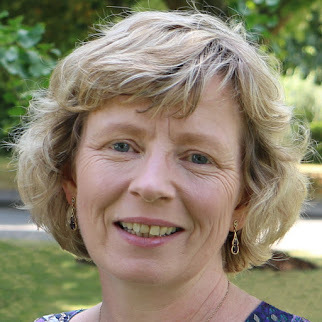 Find out more on the Royal Collection Trust website. (1) There was a limited number of photographs available to me from the exhibition and this particular print was not included. However, I found the same print on the British Museum website.